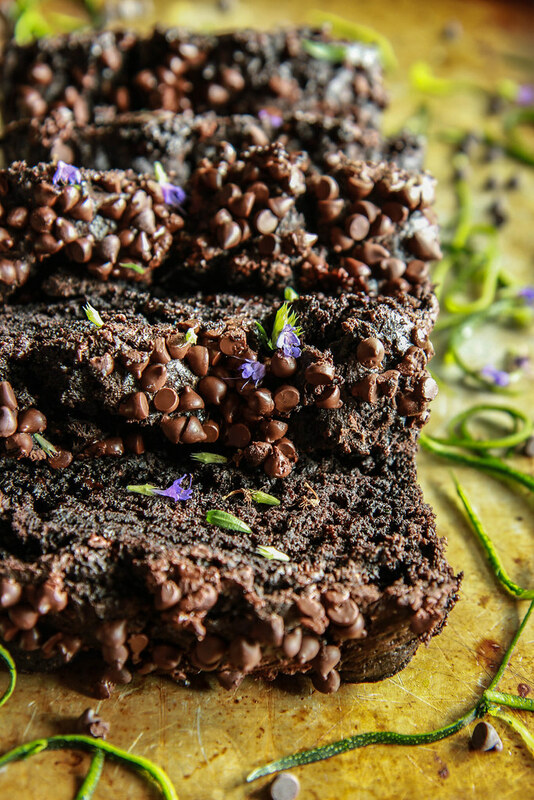 OMG- this is the most chocolatey, delicious bread, errr…. cake? whatever it it is, I want to eat all of it! Turns out that was a really good choice. I did make a loaf, and it turned out amazing. And I was not even doing it for the blog- I was just doing it for the family for the long weekend- but I did happen to post a picture of it on insta-stories. And the response on DM was overwhelming! Apparently quite a lot of people wanted to the recipe, so I made this video with Inspo! So I made another batch so that I could take a picture for you- but in typical impatient Heather fashion, I didn’t let the bread cool all the way (you should do that) before cutting it up- so it doesn’t look like a million bucks in these pictures. And also- it’s just really brown! But I swear to you it tastes like a million bucks! 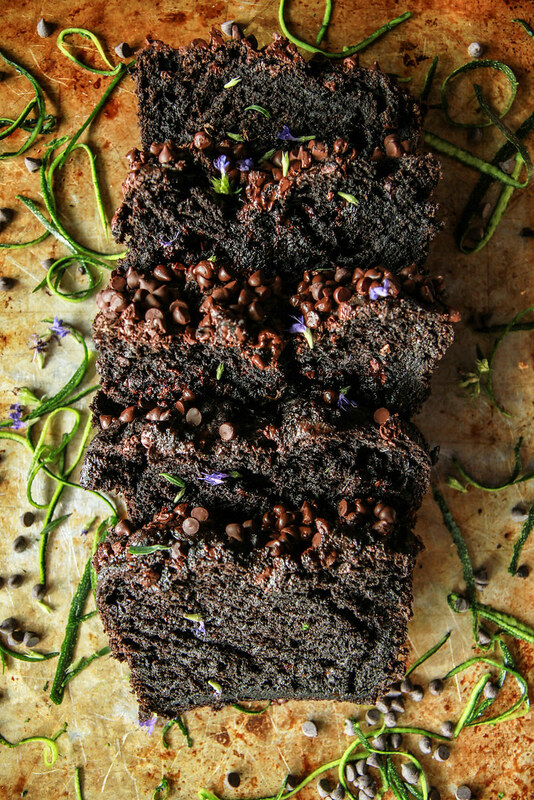 And calling chocolate zucchini bread, may be a wee-tad-bit misleading, because it tastes more like cake. The best chocolate cake you have ever had. But if we call it bread then that means we can eat it for breakfast. Preheat the oven to 350 degrees and prepare an 8x4 inch loaf pan with coconut oil spray or melted coconut oil. In the bowl of a standing mixer fitted with a whisk attachment, combine all of the dry ingredients. Add the grated zucchini, the coconut oil and the coconut milk and mix on medium speed until you have an even batter. Gently mix in 1 cup of chocolate chips. Transfer the batter to the prepared loaf pan and then sprinkle the remaining ¼ cup of chocolate chips over the top. Bake the loaf at 350 degrees for 60 minutes. Let the bread cool for 20 to 30 minutes before turning out and slicing. Looks amazing to me! And so decadent. I can see why you couldn’t wait to slice into it! Your recipes are superb & colorful, and your pics are THE BEST THERE ARE. With every pic, I wonder where you purchase the flowers … they always add THE color that makes the food colors pop. I truly don’t know of more attractive recipes & pics! Sherry- that is such a wonderful compliment- thank you so much! Can you swap out the gluten free flour for coconut flour? Hi Kathy! I have not done that, and I would worry a little about the structure of the flour not being able to keep the form of the bread- but please let me know if you try that! This looks so chocolatey and delicious! Love that it is gluten-free and egg-free! 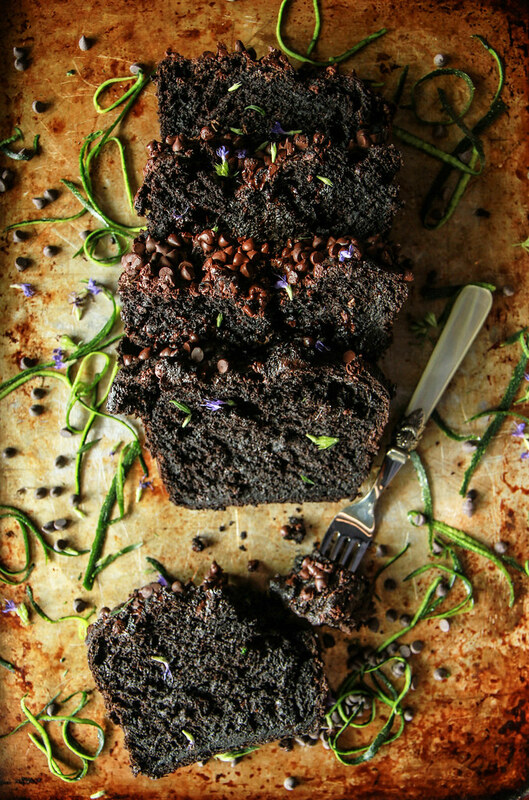 Such a perfect way to use zucchini this season! Craving now!! This looks amazing. Drooling! What brand/type of gluten free all purpose flours do you like to use? Thanks Jeanine! I use Bobs Red Mill AP GF flour! Don’t you love it when you just make a non blog recipe and it turns out perfect? Well done! I want a loaf! This sounds divine! Wondering if you’ve done any experimenting with Otto’s Cassava flour. Thinking I’d like to try it in one of your quick bread recipes like this one. This looks amazing!! I only have regular flour right now, would it turn out the same with that? I cannot wait to start using more of your recipes!!! I just got your cookbook 🙂 thank you for allergy friendly recipes!! Made these with Reg. Flour and no xanthum gum. They were delicious! Doubled the recipe and made one loaf and 18 muffins. Everyone loved them! Thank you! Hi! What kind of sugar do you use for this recipe? I used organic beet sugar, but cane sugar is perfect! Do you think I would be able to bake this in a cake pan instead? Just wondering if you think this would come out in a sheet cake pan or a small cake pan? Just looking to serve more people. Sure! But you would probably bake about half the time! Made this yesterday and IT IS AMAZING. I love when the vegan/gf version is better than the regular! Thanks Heather! This looks SO decadent. Can’t wait to try it out!! This is a chocolate lover’s dream!! Looks Fab can’t wait for my zucchini to be ready for picking. Thank you Heather!!! This recipe is AMAZING! So delicious! Thank you for sharing! I am so excited to make this today, but do you have the nutrition info by chance? Thank you for the gluten free recipe, I will try it for a party next week! Great! hope you like it Kathryn!